TGA Approved - Reynard Health Supplies Alcohol & Chlorhexidine Swabs contain 70% Isopropyl and 2% Chlorhexidine. 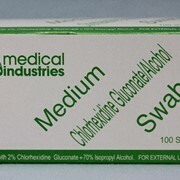 Chlorhexidine is a chemical antiseptic and is also bacteriostatic - it kills both gram-positive and gram-negative microbes. 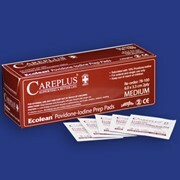 Reynard Health Supplies Prep Pads are larger than most common swabs, making it easier for topical cleansing prior to injection.